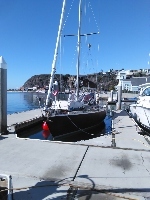 Rogers Petersen 39' retired race boat. Canada to Mexico and back in 5 month veteran. All gear required to head south again included. Refigeration, solar panels, chartplotter, 3 anchors, etc. You provide the divorce. Before or after the voyage. Recommend it to a friend. $45,000 but price negotiable.